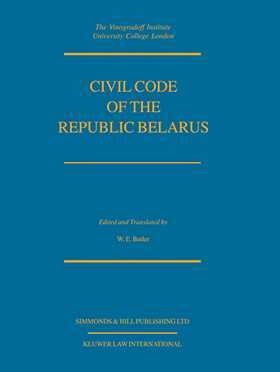 Even though the economic union of Russia and Belarus is virtually complete, important material differences persist between the civil codes of the two countries. Of particular significance to foreign investors in Belarus are the provisions regulating intellectual property, inheritance, and private international law--provisions that set Belarus apart from other CIS jurisdictions and that make it especially attractive to businesses critically affected by these considerations. This fourth volume in the CIS Civil Code series presents the Belarus Civil Code that entered into force on 1 July 1999. William E. Butler's English translation is of the high quality that has come to be expected by counsel for international investors with a special interest in the CIS countries.